Please join us in welcoming Dr. Chan Hellman, one of the leading Hope researchers, to Thurston County! TWO FREE DAYS of EDUCATIONAL & INSPIRATIONAL WORKSHOPS! 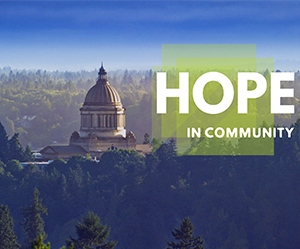 Relating Hope theory and science to the Thurston Thrives framework and community collective impact. Intended audience: Thurston Thrives leaders and stakeholders, nonprofit board members and local elected officials. Applying Hope theory and science to the improvement of organizational health, teams and workforce. Intended audience: organizational leaders including leaders in: education, social service, law enforcement, government, tribal communities, healthcare, higher education, financial institutions and state agencies. Connecting the language, theory and science of Hope to daily work with individuals affected by trauma. Intended audience: social service staff and practitioners dealing with vulnerable populations, foster parents and social service volunteers. Understanding the economic value of Hope on business and the economy. Improving Hope in business organizations. Applying the theory, science and language of Hope in educational settings and work with children and families. Bringing Hope to the work day and life. Intended audience: k-12 teachers, para educators, early childhood professionals and individuals working with vulnerable populations. JOIN US! Please register here.